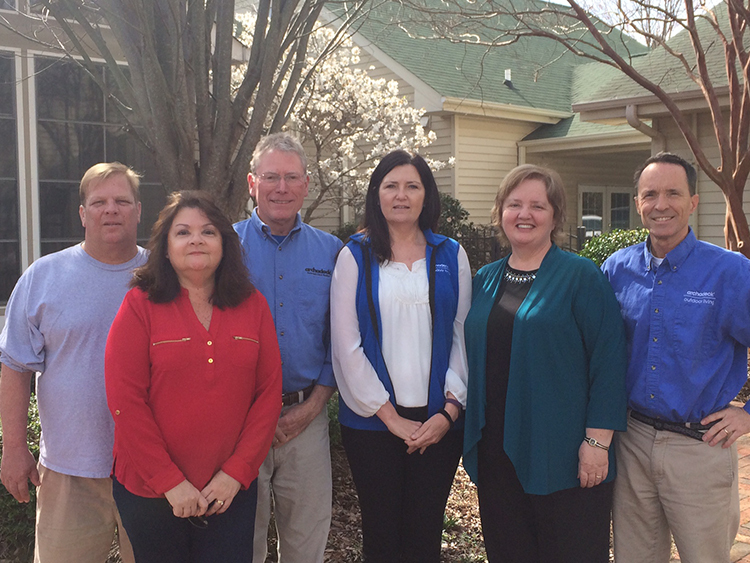 Plans and approvals for this Winston-Salem 3-season room are in place, and we are ready to tackle the demolition and new footings for the outdoor deck. The tile flooring and backer board are being removed and will be replaced with pine tongue-and-groove planking. 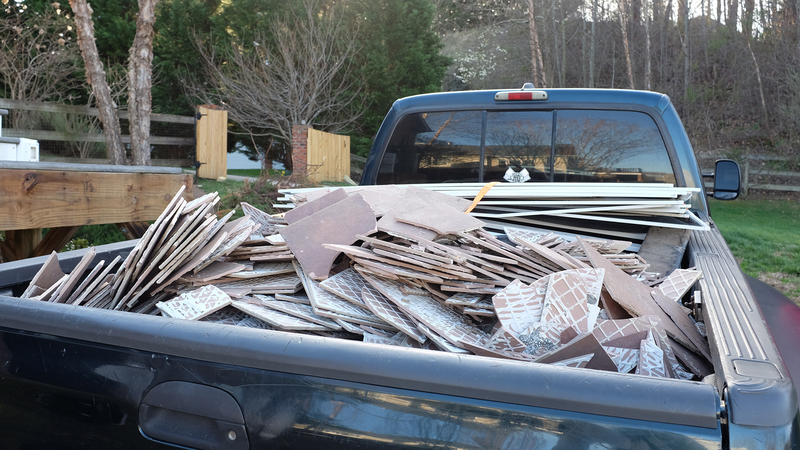 Prying up ceramic tile is a time-consuming process. 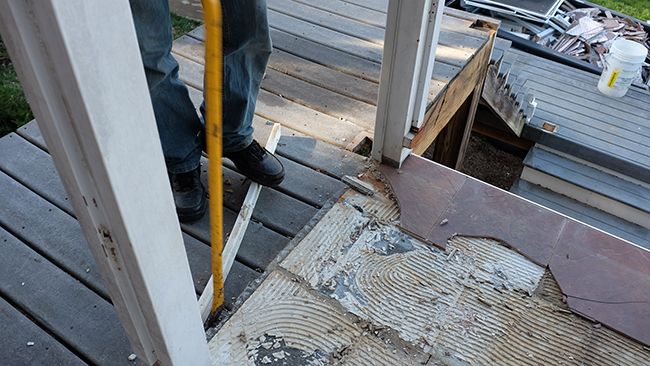 The thinset subfloor will need to be taken up separately, and a plywood subflooring will need to be installed to support the new pine tongue-and–groove planking. The screening is taken out as well as the railing along the stairway. For now, the old decking is left in place to allow access to the room above. New support posts will be installed to work with the EZE-Breeze windows, and new Timbertech material will replace the white fascia. 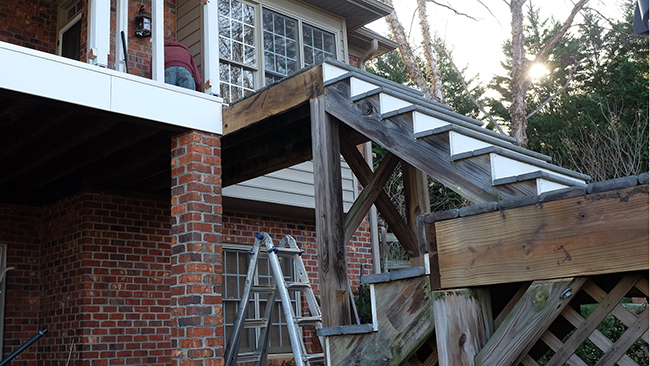 The dark brown Timbertech will look great with the deck and railing and will create a more cohesive look than the previously white screened porch. 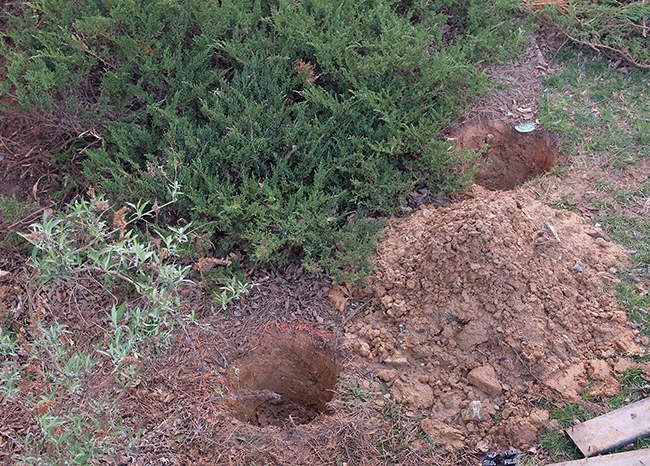 The new footings have been dug to specifications in preparation for the outdoor living area that will extend from the right side of the 3-season room. 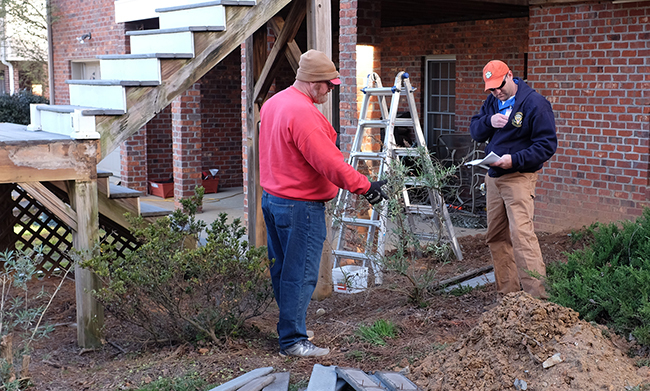 Our experienced builders have a great relationship with many of the city inspectors, who know that Archadeck builders never cut corners and build things right the first time, so passing inspection is rarely a problem. The support posts and floor joists for the outdoor living space have been secured. Archadeck uses only quality lumber and has made it their mantra to not only meet code standards but to exceed these standards for an extremely solid and long-lasting foundation. Quality of materials and workmanship is never compromised. This philosophy even extends to the smallest of details – like the use of weatherproof screws instead of plastic screws on the hip frame. Once the supporting structure for the outdoor living space is complete, a new plywood subfloor is put down as a base in the 3-season room. 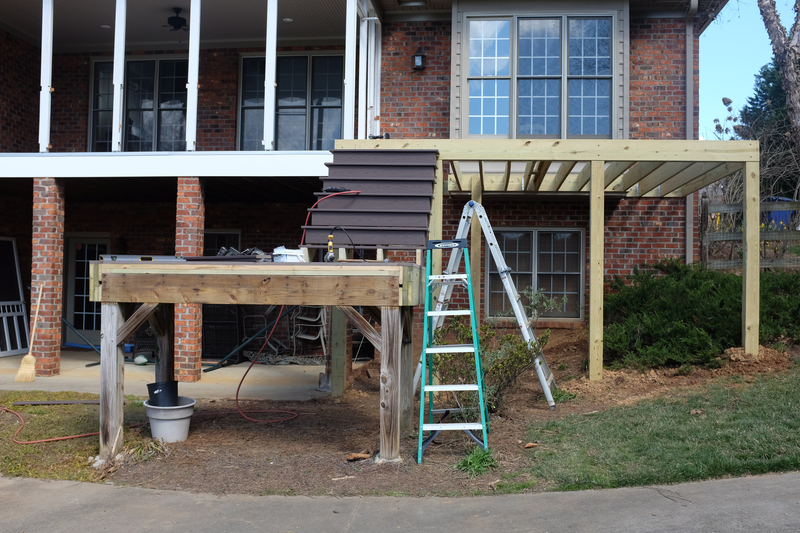 We install the new Azek planking on the deck at a diagonal for an appealing look. The dark brown Kona with its woodgrain texture looks great, so it’s time to start the railing. RadianceRail by Timbertech is installed, chosen for its smooth lines and hidden hardware. 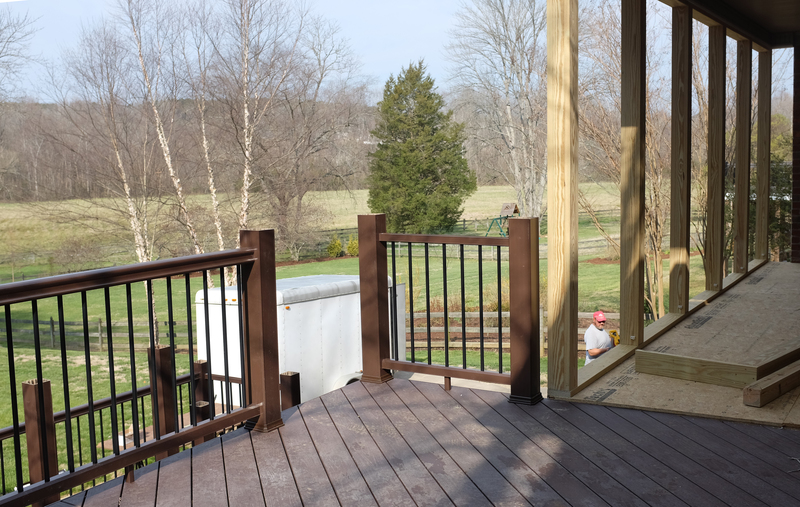 It’s no wonder this railing is one of the most popular railings that Timbertech offers! Custom balusters are no problem – Square balusters in black aluminum are custom-drilled, which takes a good deal of patience and perfection to ensure a tight fit. After the railing is complete, the only thing left to do is to install the Endcaps. 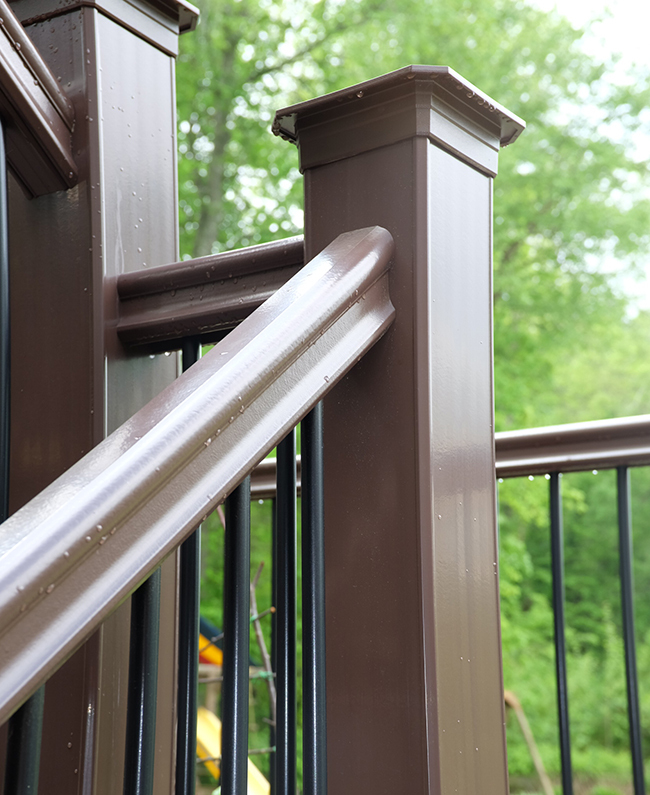 This detail puts just the right finishing touch on the handsome, sleek Timbertech railing. With the railing in place, we go ahead and finish up the stairway with the Azek planking while we wait for the EZE-Breeze windows to be delivered. The project has been running smoothly, and we can visualize how everything is starting to come together. We’ll move next week to finishing the tongue-and-groove flooring and installing the EZE-Breeze windows in the 3-season room.